According to Eric Weiner, author of The Geography of Bliss, Asheville, North Carolina, is the happiest city in the U.S. Coincidentally, just after reading his book, I read Serena, a fictional tale of a timber empire in the mountains of North Carolina, near Asheville. So, on our recent trip through North Carolina, it seemed logical to stop in Asheville. No matter how brief. The rain and winter evening skies prevented us from seeing what must be beautiful views of the Great Smoky Mountains on our drive from Chattanooga, Tennessee, to Asheville. As we drove, I read about the Biltmore, George Vanderbilt’s 8,000-acre estate and tourist attraction located just south of Asheville. With its size and opulence, the Biltmore sounds like a southern version of one of the East Coast’s Newport mansions or the West Coast’s Hearst Castle. We arrived late in the evening, in time to sleep at a nondescript hotel before catching a glimpse of Asheville on our way out of town the next morning. It was Sunday, our hotel did not provide breakfast, and we were hungry. My son and I checked out Yelp. We chose the restaurant with the highest ratings, the earliest opening, and a few gluten-free options. We were not disappointed. 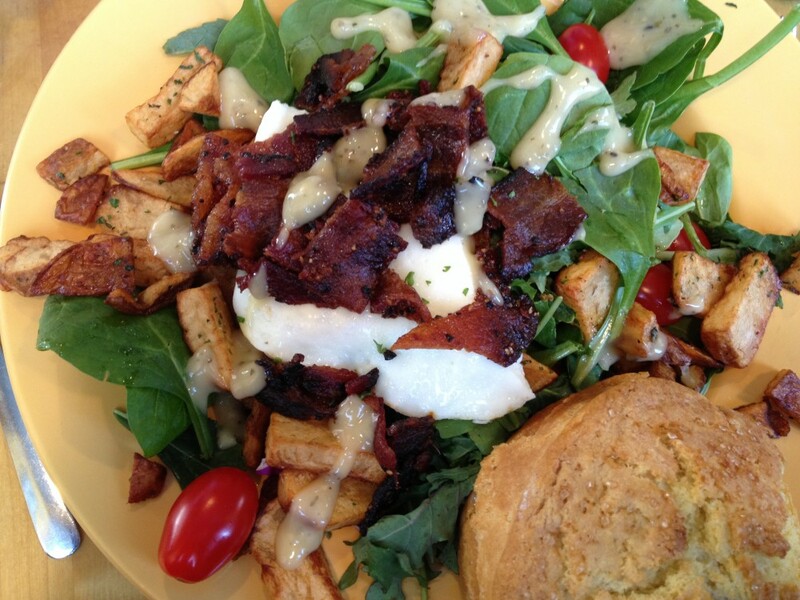 Sunny Point Cafe is located in West Asheville, just a few miles from downtown. Although we arrived when it opened, at 8:30 a.m., there was already a line out the door. We waited our turn on the protected and heated outdoor patio (it was 20 degrees outside), before being seated at the last inside table. Within minutes, even the tables on the patio were full, and the line stretched around the building outside. This place must be good. Healthy yet trendy with a southern flair, Sunny Point’s menu includes grits and biscuits alongside its tofu or local bacon options. We pondered our choices. Steak and potato hash. 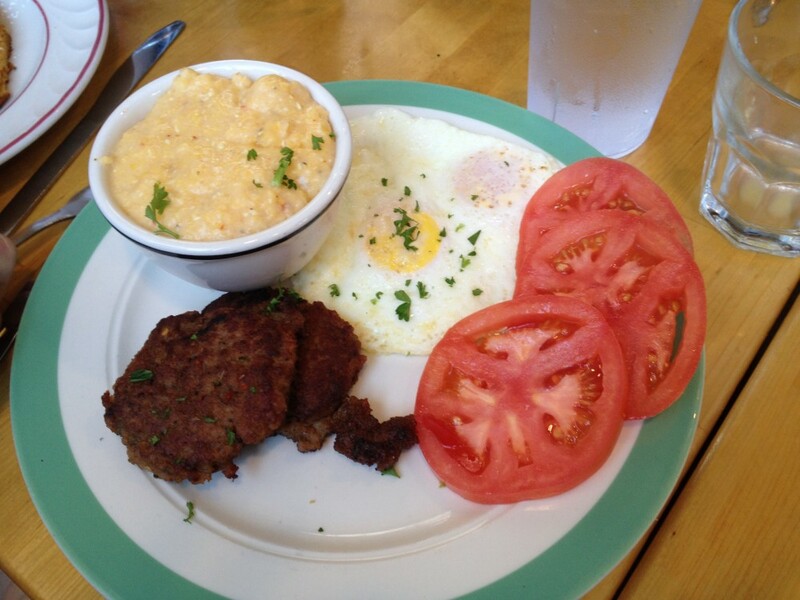 Creamy chipotle cheese grits or biscuits. I chose the breakfast salad, leaves of arugula tossed with honey hemp vinaigrette provided the bed for maple black pepper bacon, a poached egg, warm herb tossed potatoes, and tomatoes. Other choices included oatmeal or cornmeal hot cakes, huevos rancheros, or omelets. The gluten-free diner? She was happy with her Mighty Good Breakfast (MGB): two free range eggs, local nitrate free sausage, potatoes, and the chipotle grits. 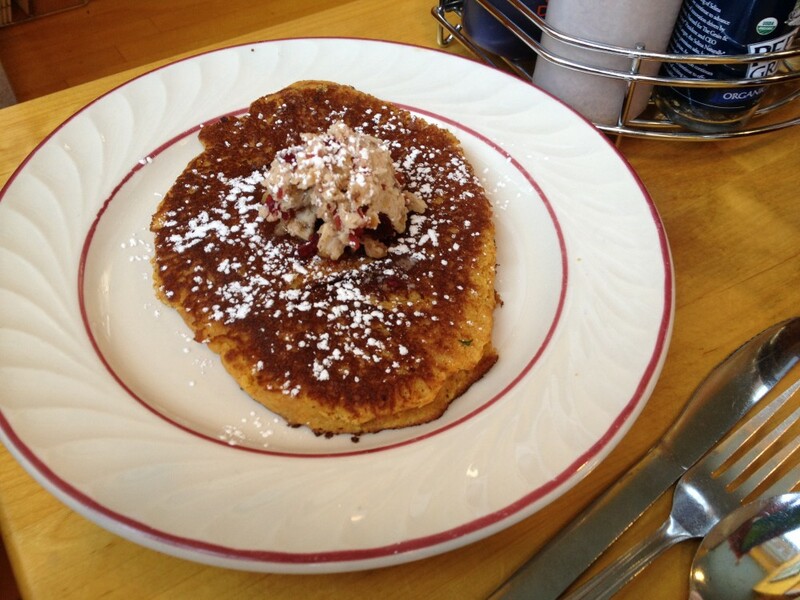 We all shared a side of the gluten-free organic cornmeal hot cakes. Our tummies full, we drove through Asheville slowly, noticing the mountain feel, the lack of chain stores, the small but inviting downtown with plenty of shops to peruse. We read about the seasonal outdoor pursuits, including zip lining and hiking and kayaking, and the Asheville’s proximity to the Great Smoky Mountains National Park and the Appalachian Trail. Asheville looks like our kind of place. We’ll have to make it a destination. And next time, we’ll allow plenty of time to tour the Biltmore. On our trip down south, we ate a lot of barbecue. After all, that’s what the south is known for, right? We tried the local spot, Smokey’s BBQ, in Madison, Alabama, and the chain restaurant, Sticky Fingers, in Chattanooga, Tennessee. Pulled pork, roasted chicken, country style ribs, cole slaw, baked beans, and corn bread. Smoky, sweet, vinegar, and mustardy sauces. Our party tried them all. And except for the corn bread, everything was gluten free. But while everyone else ate the ribs and pulled pork, I tried the Brunswick Stew. At Smokey’s, sweet strings of pulled pork competed with potato and peppers in the warm and mildly spicy broth. The stew was not thick but chunky. The meat distinct from the potatoes. I ordered fried okra. Dipped in a batter and deep fried, cooked okra has an unusual texture, somewhat slimy between the crispy fried outer later. Definitely not for all. Because we were there at closing time, our party was served the restaurant’s leftover peach cobbler and corn bread. Both yummy. I ordered Brunswick Stew again when we dined at Sticky Fingers in Chattanooga. Though the ingredients were similar, the Brunswick stew was thicker, its meat strewn throughout the stew, its pieces less distinct from the other ingredients. We liked the sauces so much at Sticky Fingers, we bought a sampling of their barbecue sauces (the Memphis Original sauce is particularly good). Both restaurants offer stuffed potatoes: a baked potato filled with pulled pork. Huge and satisfying. Though it’s atmosphere was unassuming (looking more like the inside of the fast food place it is), the food at Smokey’s relies less on its sauces than Sticky Fingers. The pulled pork and the ribs, were flavorful on their own. But don’t get me wrong. I’ll go back to Sticky Fingers next time I’m in town or to one of its other locations (there are Sticky Fingers in South Carolina, North Carolina, Georgia, Tennessee, and Florida). If you’re hankering for hushpuppies or catfish with your barbecue, you might want to check out the Old Greenbriar Restaurant located in Madison, between Decatur and Huntsville, Alabama. Unlike Smokey’s and Sticky Fingers, the Greenbriar Restaurant is rustic and full of local atmosphere. What I remember most of my college weekend in Ensenada are the fish tacos. From a small taco stand on the street, my American quarter bought me a corn tortilla filled with fried fresh white fish, shredded green cabbage, chopped tomatoes, cilantro, lime, and a white creamy mayonnaise-like sauce. I bought several tacos over the next two days, amazed at the freshness, the flavors, the price and have been searching for a similar savory experience ever since. Perhaps I’ve been eating in the wrong places, pseudo Mexican restaurants catering to their American clientele, mainly on the East Coast. Fish tacos in flour tortillas with cheddar cheese, iceberg lettuce and tasteless red salsa is more common than not. My kids groan at my disappointment. I am too picky and should know better than to order fish tacos in New England. It was time for a trip to Santa Barbara, a town near enough to the Mexican border to have the real thing, and while I paid more than a quarter, each taco on my trip far exceeded my culinary expectations. 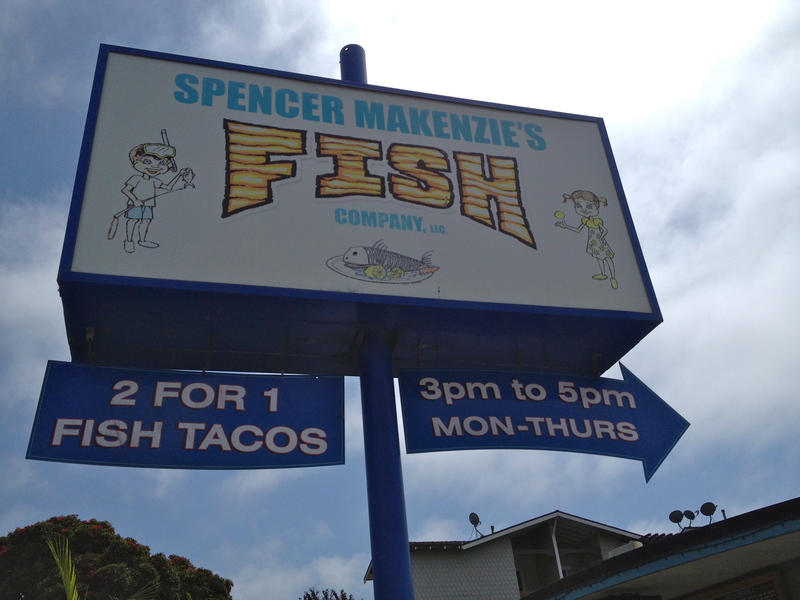 First stop: Spencer Makenzie’s Fish Company: a small beach takeout and eat-in restaurant in Ventura, California, 30 miles south of Santa Barbara. 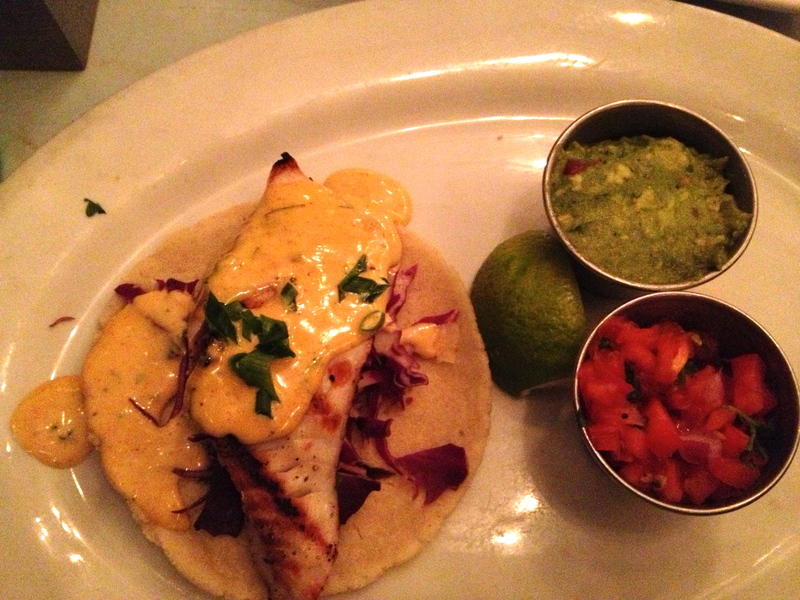 My friends and I ordered the “giant fish taco” with grilled fish and requested corn tortillas instead of flour. Chopped cabbage, cilantro, delicious and only $4.99. It wasn’t giant, but I was happy; my friends were disappointed. There are better tacos around the corner they told me. We’d go there another day. 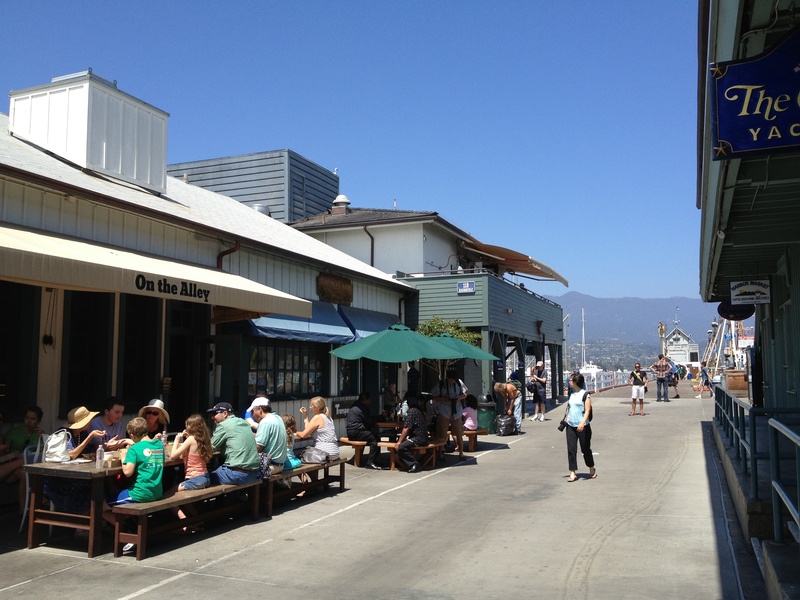 Second stop: On the Alley: a small takeout place on the harbor in Santa Barbara. The menu was promising. 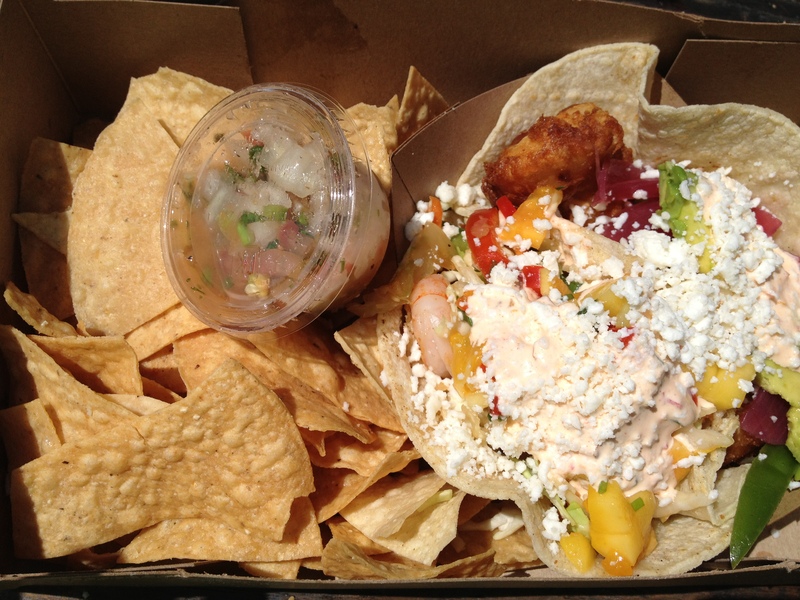 I ordered two: the Baja Fish Taco (beer-battered fish, avocado, pickled onion, queso fresco, and salsa blanca) and the Shrimp Taco (seared shrimp, ponzu-marinated slaw, queso fresco, salsa blanca, and mango salsa) served in corn tortillas. They were both so good, the perfect blend of flavors and textures, and only $3 each. Third stop: Natural Café: a restaurant specializing in healthy, local, and green living with several locations in southern California. Although we ordered at the counter, here our food was brought to the table. 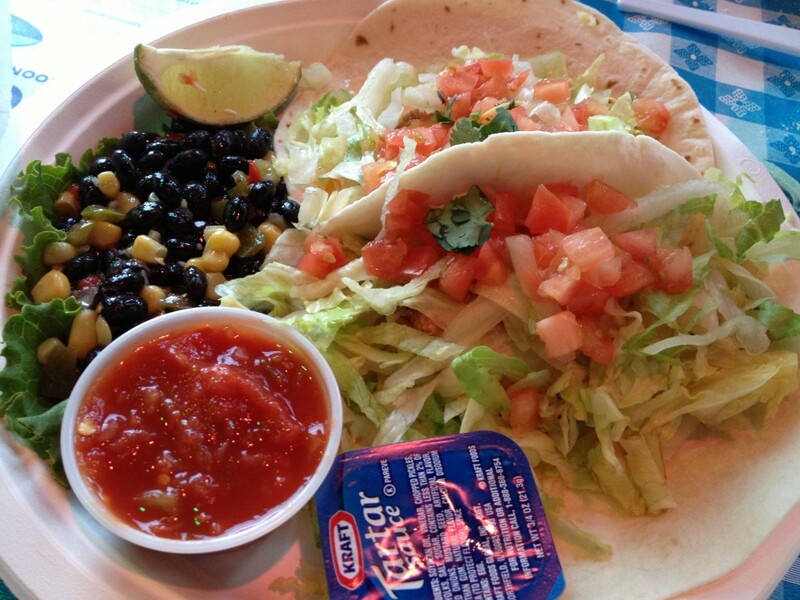 I chose the Cabo Fish Tacos: two tacos for $8.59. These tacos were different than the others in flavors and textures. Instead of grilled or fried, the fish was sautéed in a tomato-based salsa. The addition of coarsely shredded carrots reminded me of a salad. Would I go back? Yes, but not for the tacos. 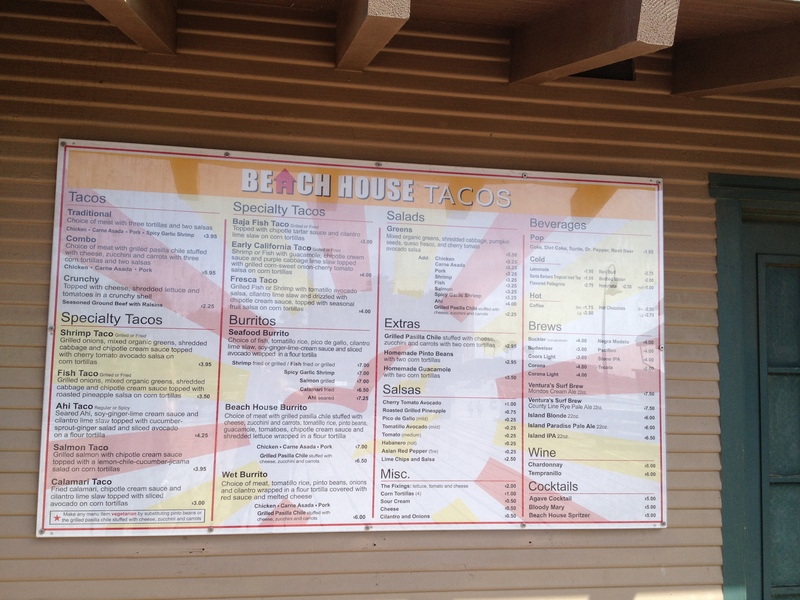 Fourth stop: Beach House: takeout on the Ventura Pier; a fish taco mecca. Six fish taco options plus a shrimp taco and a calamari taco. After much deliberation, I chose two, the Baja Fish Taco ($3) and the Early California Taco ($4). 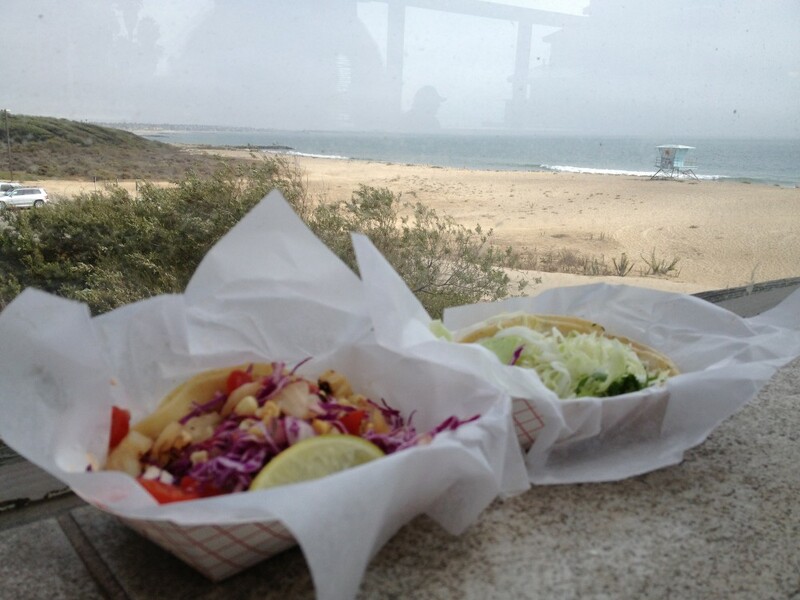 I sat at a counter inside while watching the surf through the window, enjoying the many flavors of my tacos: the tangy and sour of the lime, the distinct flavor of cilantro, the spicy chipotle sauce, the finely shredded cabbage and the flaky grilled fish. Yum. Fifth stop: Blue Plate Oysterette: a full service restaurant on Ocean Avenue near the Santa Monica Pier. 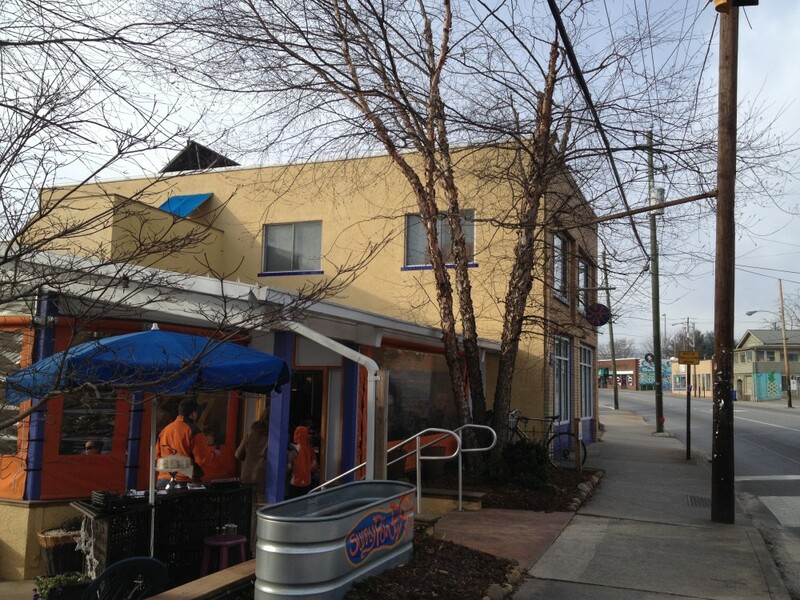 The question, should we eat at Blue Plate Tacos or Blue Plate Oysterette? 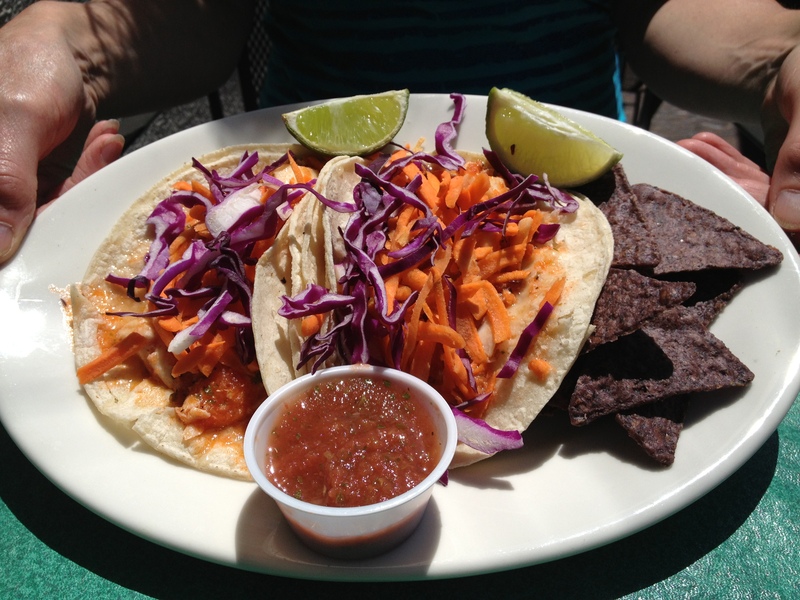 My friend and I were advised to eat at Blue Plate Oysterette where we were told the fish tacos were the best. We sat outside at this sidewalk café, warmed by propane heaters and Mexican blankets, and enjoyed being waited on. We ordered the fish tacos: spicy aioli, grilled mahi mahi, purple cabbage, chopped cilantro, and lime; these fish tacos were some of the most delicious, the biggest piece of fish, and the most expensive ($15), if not the most authentic tacos we’d had all week. I will return; there are so many tacos I didn’t try. And now, after a few months back in New England, I haven’t given up hope of finding a good fish taco closer to home. I ate a surprisingly delicious salmon taco at an autumn fair in September and a tasteless one at a Mexican restaurant last weekend. I’m still looking, but if I want a sure thing this far away from the border, I stop at the fish market, start up the grill, and make my own fish tacos, just as I like them. I just made the best cookies. No, really, they are so good. They happen to be gluten free, egg free, and if you’re picky about the chocolate chips, they’re dairy free, lactose free, and vegan as well. But don’t let that stop you from trying them. The cookies are chewy and chocolaty (yes, chocolaty is a real word, also spelled chocolatey), and you can’t stop at just one. So, what’s the secret? 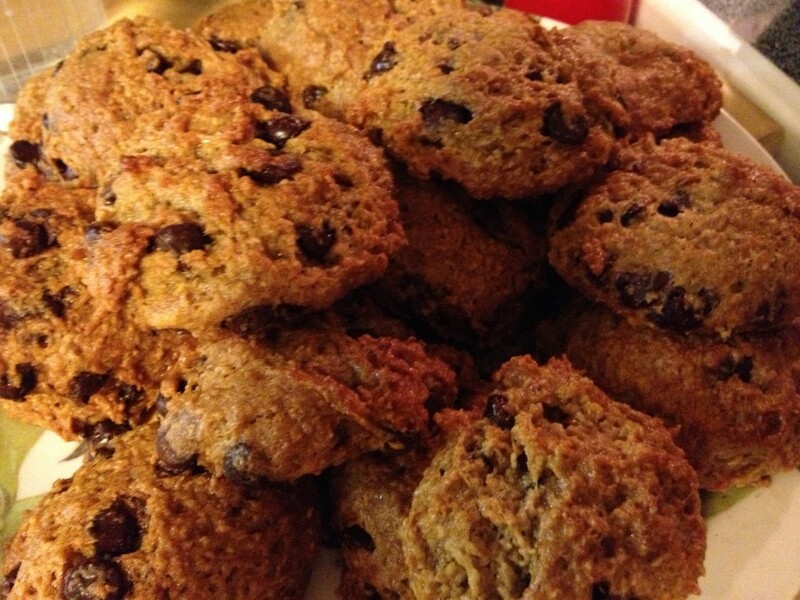 The cookies are made with oat flour, which gives them texture and chewiness, and coconut oil, which gives them a hint of coconut (use canola oil if you don’t like coconut). If you’re not gluten free, just replace the gluten-free flour with wheat flour and omit the xanthan gum, though I can’t vouch for that change in the recipe. 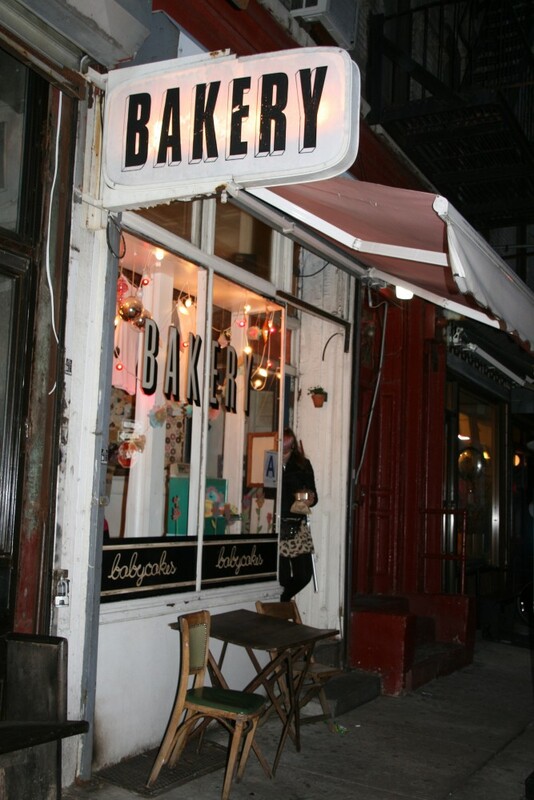 Have you heard of BabyCakes NYC Bakery? The creator of this yummy recipe, Erin McKenna, is also the founder of that bakery. And next time you’re in New York City, you just may want to make a trip to 248 Broome Street and try out one of their cupcakes, like we did on our last trip. Or you can visit them in Hollywood or in Orlando, too. Step 1: Preheat the oven to 325 degrees F. Line two rimmed baking sheets with parchment paper and set aside. Step 2: In a medium bowl, whisk together the flours, sugar, flaxseed meal, arrowroot starch, xanthan gum, baking soda, and salt. Add the coconut oil, applesauce, and vanilla and stir with a rubber spatula until a thick dough forms. Stir in the chocolate chips until evenly distributed. Step 3: Drop the dough by the tablespoonful onto the prepared baking sheets, about 1-1/2 inches apart. Bake for 7 minutes, rotate the baking sheets, and bake for 7 minutes more, or until the cookies are golden brown and firm. Let stand on the baking sheets for 15 minutes before eating. 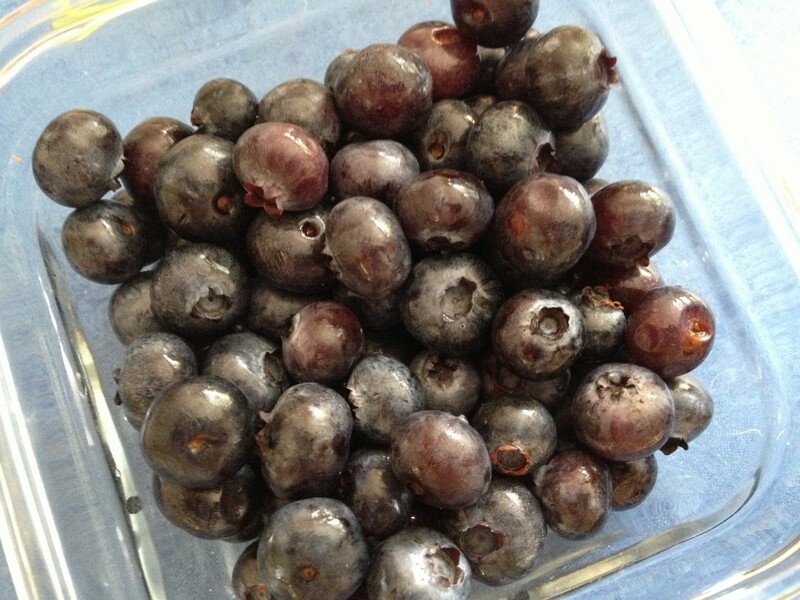 I love peaches, and I love blueberries. So when mid-summer happens, and the fruit is ripe, I’m in heaven. 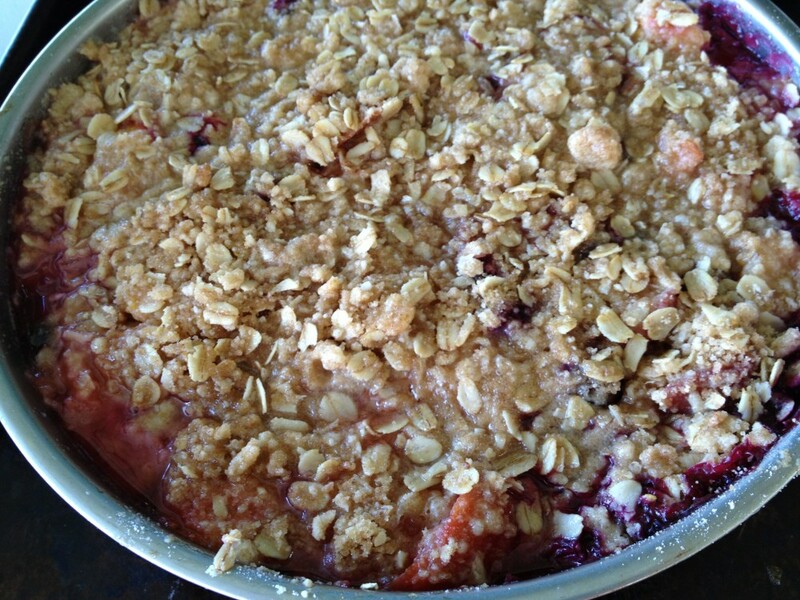 Last week, I bought peaches and blueberries from two local farm stands, a lemon and a few other ingredients from the supermarket, and set out to create a gluten-free, nut-free peach blueberry crisp. I was bringing the only dessert to a party of 12 so I wanted to make a lot. With a pint of blueberries and about nine peaches, I was ready to begin. 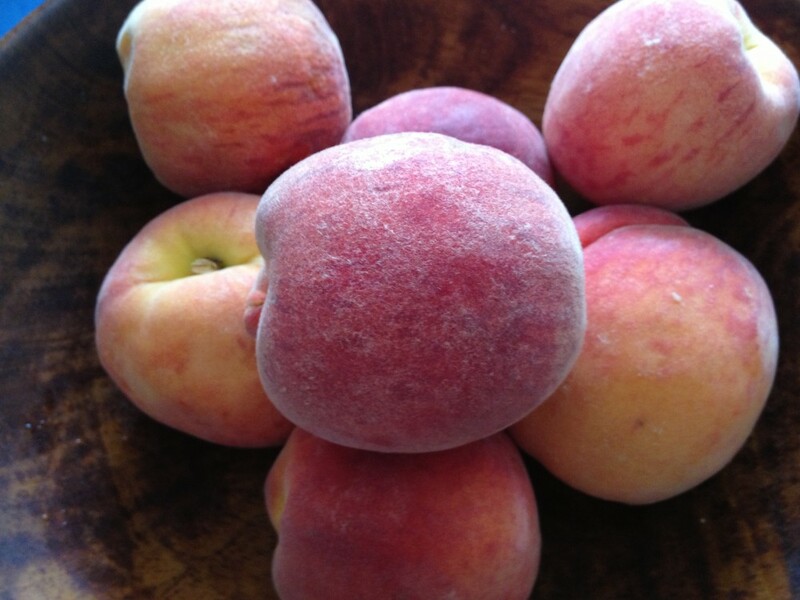 I washed the peaches and cut them into chunks, leaving the skin on. In a large bowl, I added a pint of rinsed and stemmed blueberries to the peaches along with the grated lemon rind and lemon juice. I tasted the fruit. 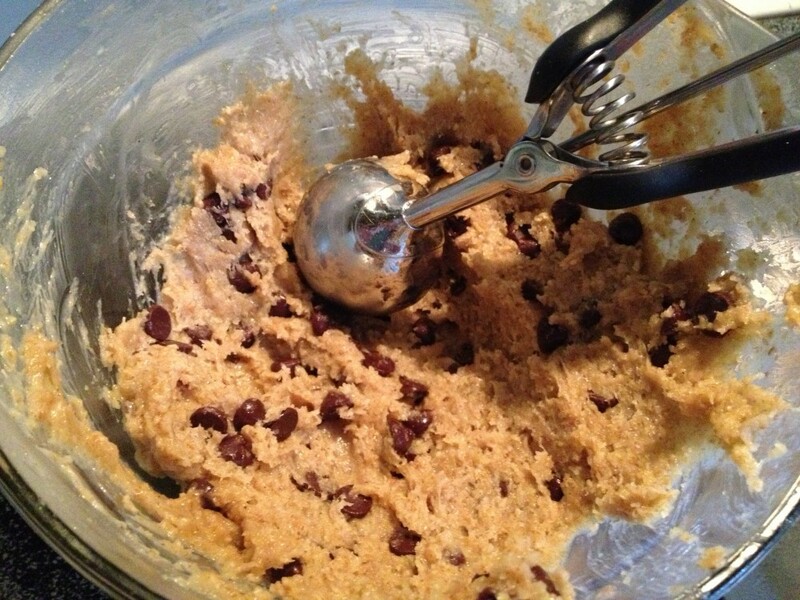 It was so sweet, I was afraid to add too much sugar; just a ¼ cup went into the bowl. 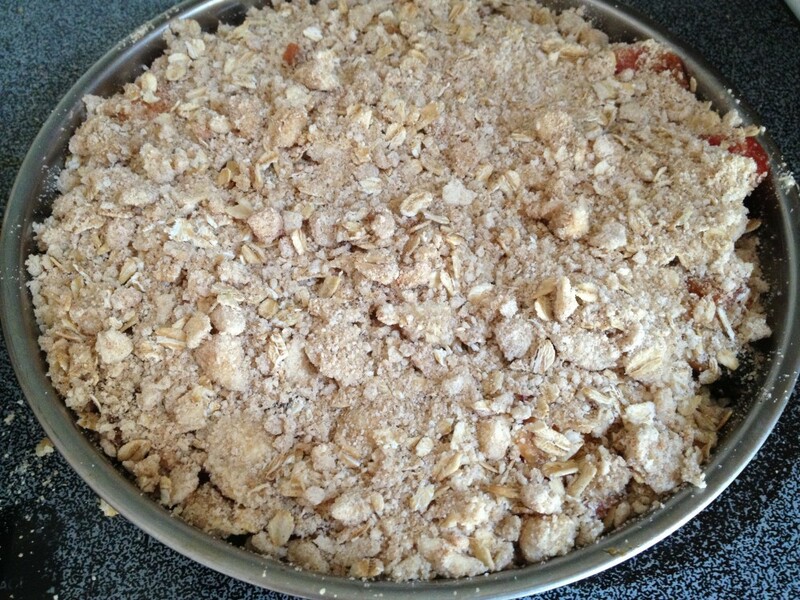 For the crisp, I mashed a stick of butter with a cup of brown sugar before adding the flour, nutmeg, and oatmeal. Though I started out using a fork, I found it much easier to use my fingers to blend the topping. Since my 13 x 9-inch pan was already in use, I buttered two 9-inch cake pans and filled them evenly with the fruit before covering them with the crisp topping. After baking at 350 degrees for 35 minutes, the crisps were brown and bubbly. At the party, the crisp was devoured, and the recipe was requested. Yum! Oh, and I never mentioned they were gluten free, and no one ever asked. Add fruit, sugar, and lemon rind and juice and stir. Blend the dry ingredients with the butter until the mixture is coarse and clumpy. 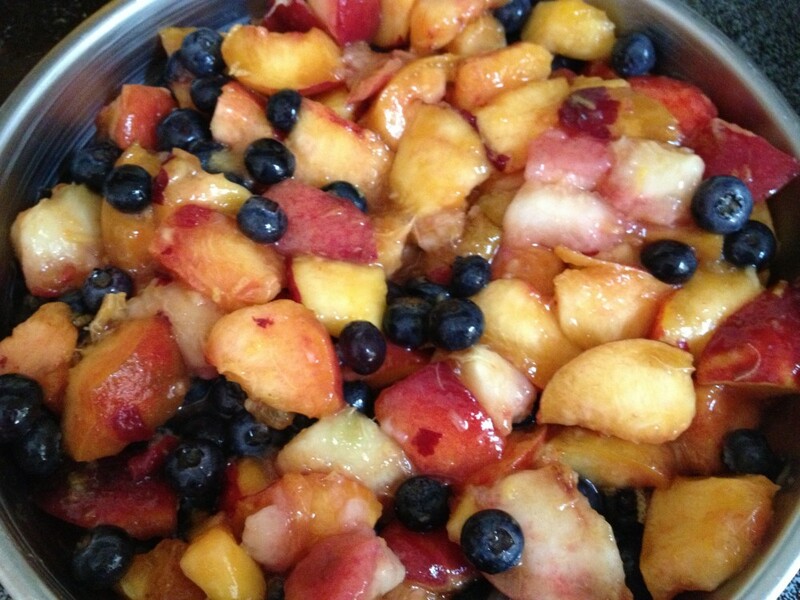 Add the fruit to one large (13 by 9-inch) or two small (8 by 8-inch square or 9-inch round) pans. Cover with the topping and bake at 350 degrees for 30 – 40 minutes. Looking for a quick escape from Boston? 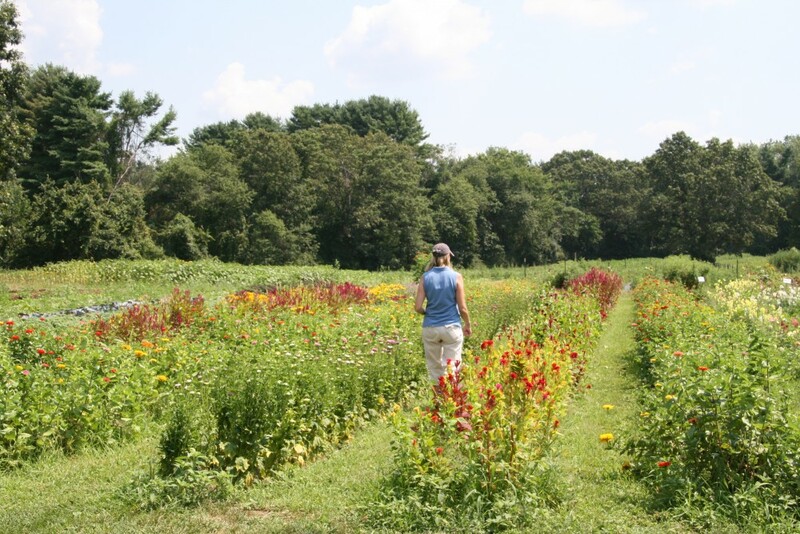 Just 30 miles west, in the small semirural town of Stow, is an organic pick-your-own farm where rows of basil, sage, and mint fragrant the air, and sunflowers, snapdragons, and zinnias color the sky. 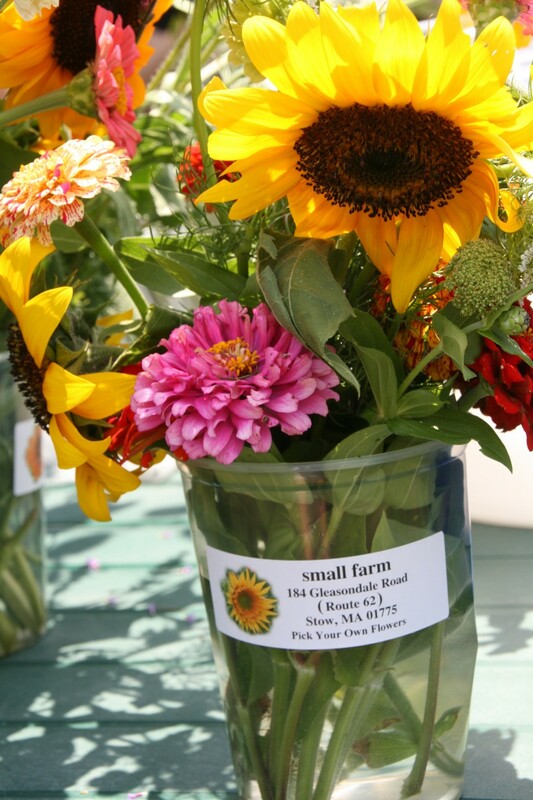 At Small Farm, you can surround yourself with cherry tomatoes in a mini maze, pick your own flowers by the quart, or snip your own herbs by the bag and bask in the farm’s peacefulness and tranquility. 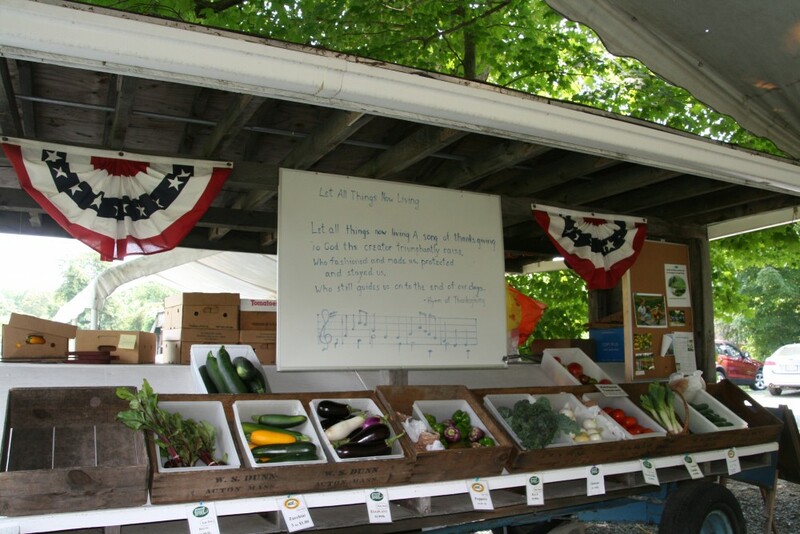 Organic lettuce, cucumbers, onions, peppers, garlic, zucchini, tomatoes, eggplant, beets, and sometimes corn are available for purchase as well. You might even find local honey or jam sold by the cash register. Enjoy your bounty, and when your tomatoes are eaten, your pesto devoured, and your bouquets have faded, Small Farm will be waiting for your return, at least until after the first frost. Trip taken: often. 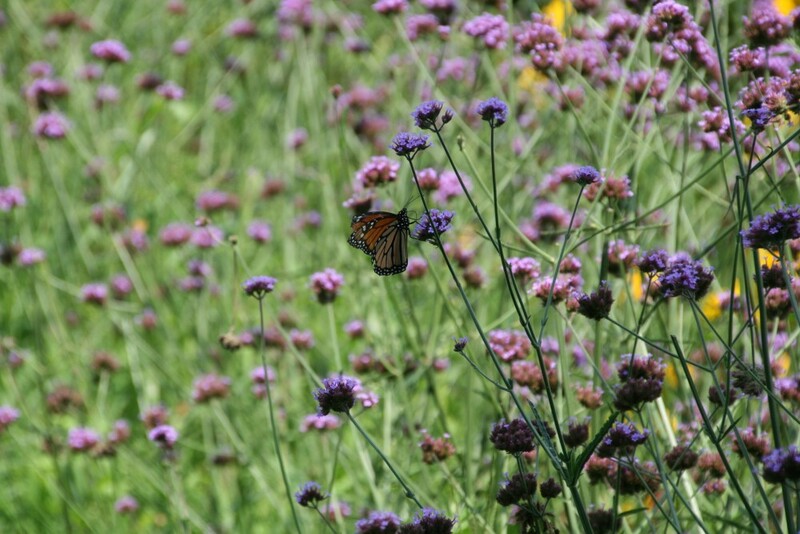 Photos taken August 2012. If Point Reyes National Seashore is your destination, be sure to allow time to visit the small town of Point Reyes Station before or after your trip to one of the most striking locations on the west coast. 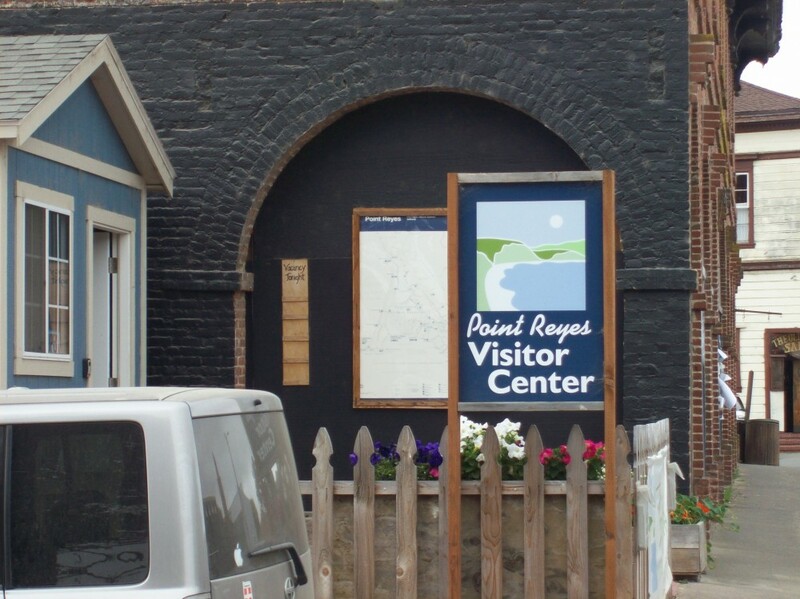 Once you’ve visited the Bear Valley Visitor Center, made your way to the beach at Limantour or hiked to Abbott’s Lagoon, seen the Tule Elk and maybe driven out to the lighthouse, stop in at the small town of Point Reyes Station for a bite to eat and a little shopping. 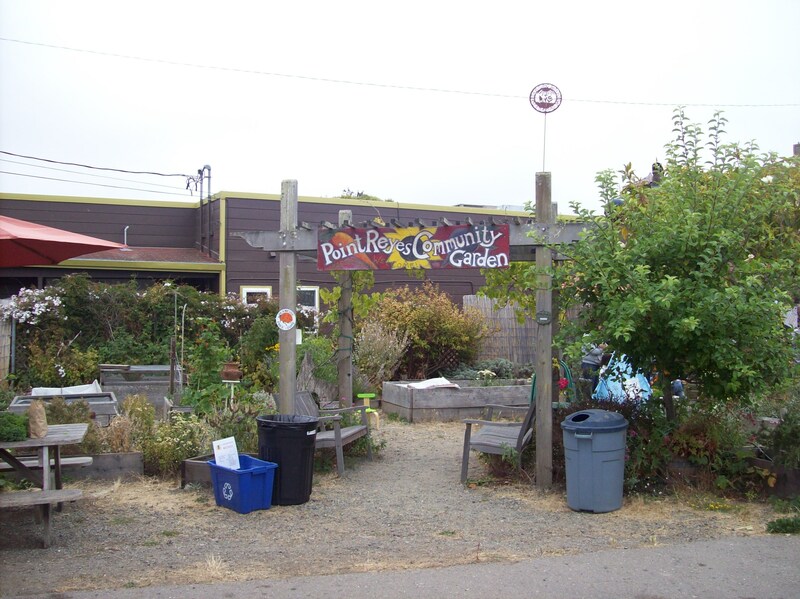 Every time we make Point Reyes Station our destination, we visit a few of our favorites. 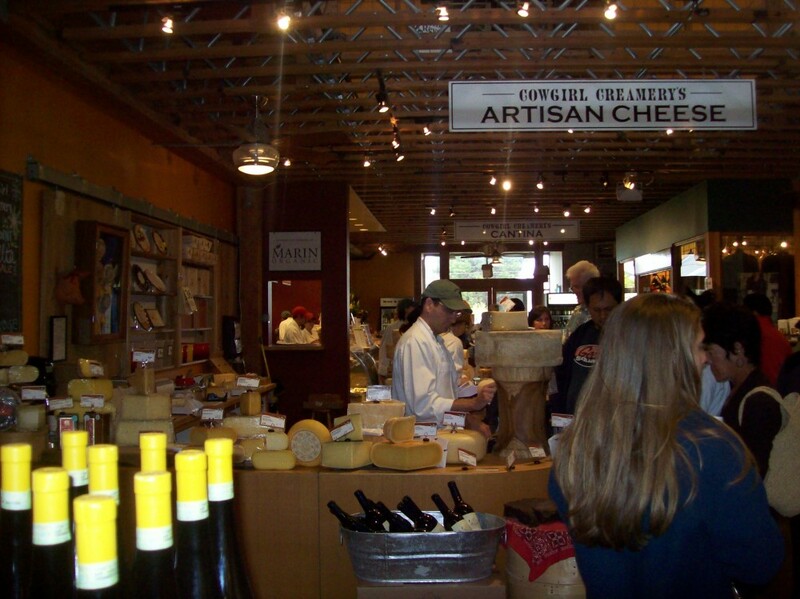 We stop at Bovine Bakery for coffee and a sweet or savory snack and at Cowgirl Creamery’s Deli in Tomales Bay Foods for the best cheese around. You can find picnic essentials at Palace Market and a book for the beach at Point Reyes Books. On our last visit, we walked through a tiny flea market, browsed the variety of items at Toby’s Feed Barn, ogled the fine art at Gallery Route One, and bought a wetsuit at Point Reyes Surf Shop. If you go, be sure to dress in layers. It’s usually cooler and windier on the coast. 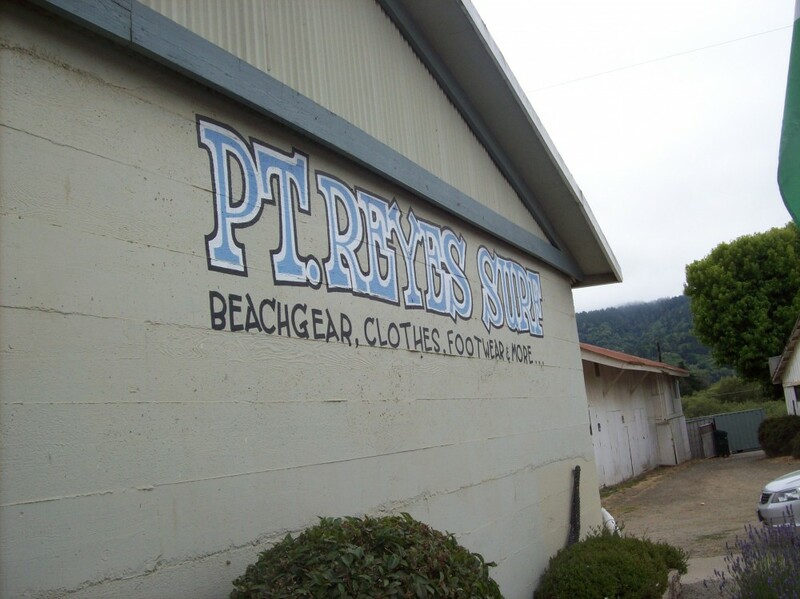 The town of Point Reyes Station is located on Highway 1, about an hour’s drive north of the Golden Gate Bridge. Though not as big as the farmer’s markets of southern Marin County, the farmer’s market in Point Reyes Station is every bit as colorful and unique. On a trip to San Francisco last August, we headed up the coast, stopping in the small town of Point Reyes Station for lunch. Cyclists abounded. We followed them and a few locals behind Toby’s Feed Barn and discovered a completely local and organic market. We meandered about the kale and figs, the booths of soap and candles, the squash and peaches, the jam, the hummus and pita bread, the chips and salsa. We listened to a local folk band, choosing freshly made quesadillas and tacos over oozing grilled cheese sandwiches for lunch. We sat at a picnic table next to the town’s community garden. If you want to go, choose a Saturday morning. 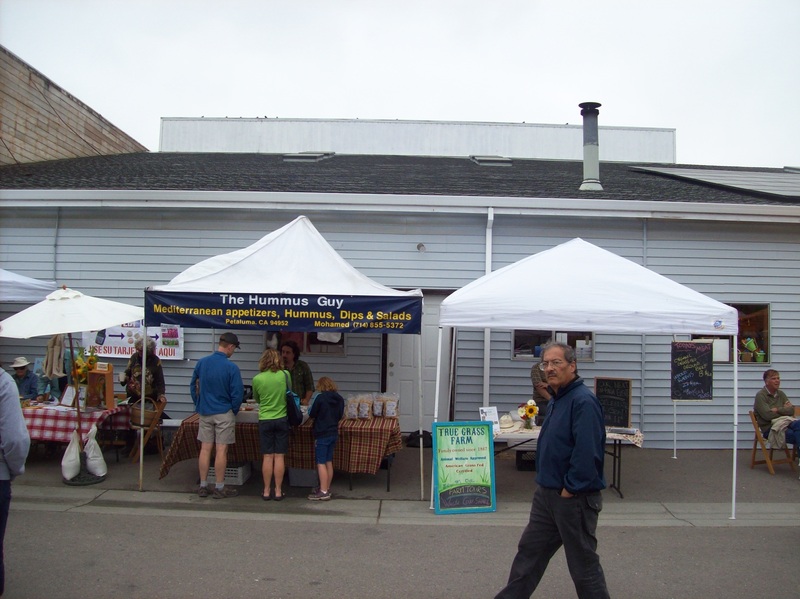 The market is open every Saturday from 9 a.m. to 1 p.m. After crossing the Golden Gate Bridge, follow Highway 1 north about 34 miles to Point Reyes. 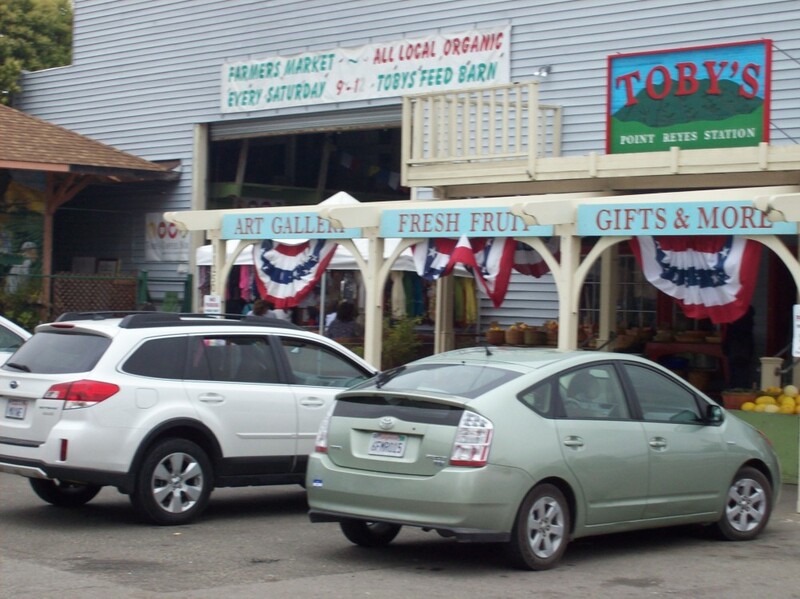 The farmer’s market is located behind Toby’s Feed Barn, right on Highway 1. You’re in unfamiliar territory. You’re driving (or flying) for miles, and you need a burger. Or at least someone in the backseat does. Besides the obvious and familiar chains, where do you find a good and quick burger when you’re far from home? Here are a few places we’ve found while driving up and down the West and East Coasts. In-N-Out Burger: The menu at In-N-Out is simple and old fashioned: just burgers (made with 100% beef), fries (fried in vegetable oil), shakes (made with real ice cream), and beverages. 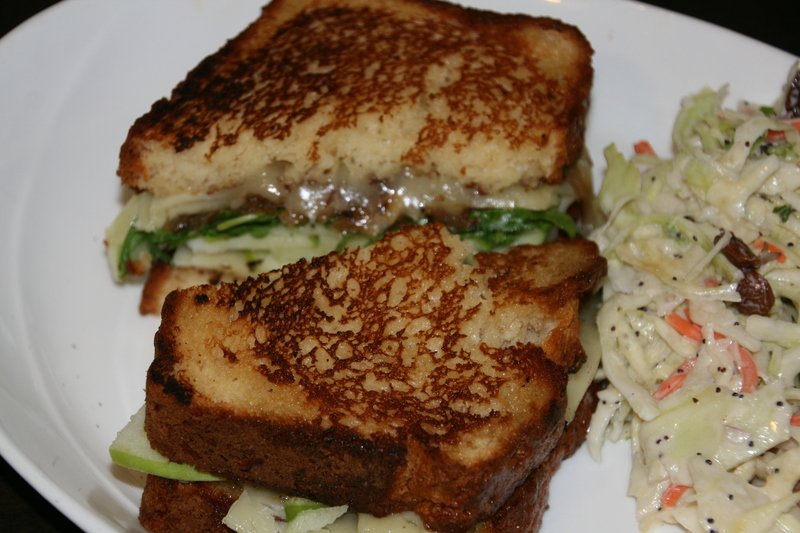 If someone in the family doesn’t eat meat, they can order a grilled cheese. 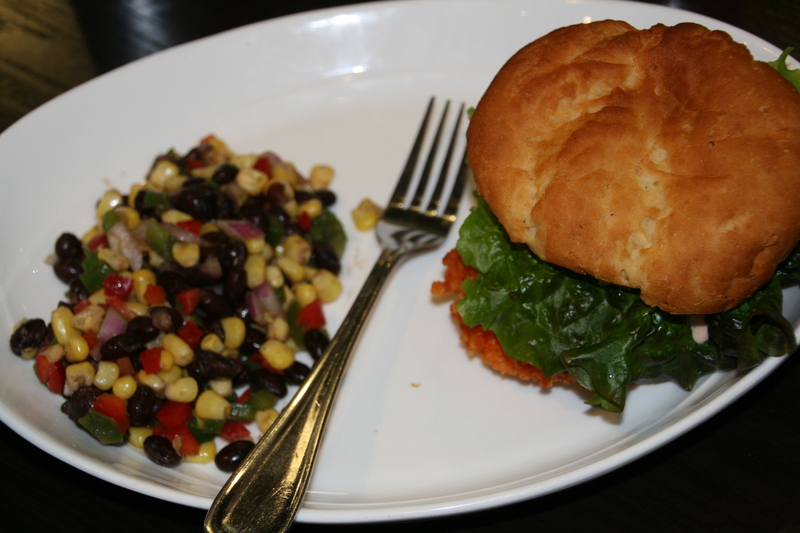 If you’re gluten-free, be sure to order the “Protein Burger,” a burger wrapped in a lettuce leaf instead of a bun. Messy but yummy. Five Guys Burgers and Fries: We first discovered this burger place on a trip to Florida only to learn there was a location close to home. With another simple menu, Five Guys Burgers and Fries specializes in burgers and hot dogs with your choice of a plethora of toppings. And the fries are good and plentiful. But don’t come here if you’re allergic to peanuts. 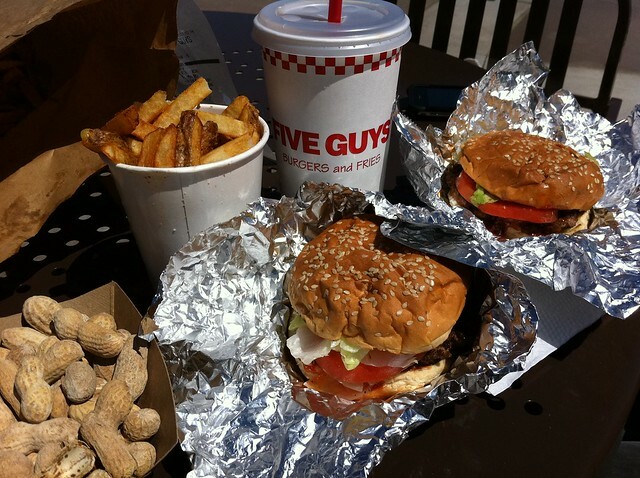 Five guys uses peanut oil and offers peanuts to customers as they wait for their burger. If you’re gluten free, just get a burger without the bun. The burger is gluten free, even if the bun isn’t. Five Guys is located in 47 states. If you live in Alaska, Hawaii, Iowa, or South Dakota, you’ll just have to travel. A small New England burger chain, Wild Willy’s has only six locations in Massachusetts, Maine, and New Hampshire. While its burgers are made with certified Angus, all natural beef or even bison, Wild Willy’s offers more than specialty burgers. There you can get a grilled chicken or steak sandwich, or salad with fries or onion rings and a shake. If you’re gluten free, make sure to ask for a gluten-free bun, and check to see if the fries or onion rings are fried in a dedicated deep fryer. Last time we checked, both were gluten free at the Worcester, Mass. location. 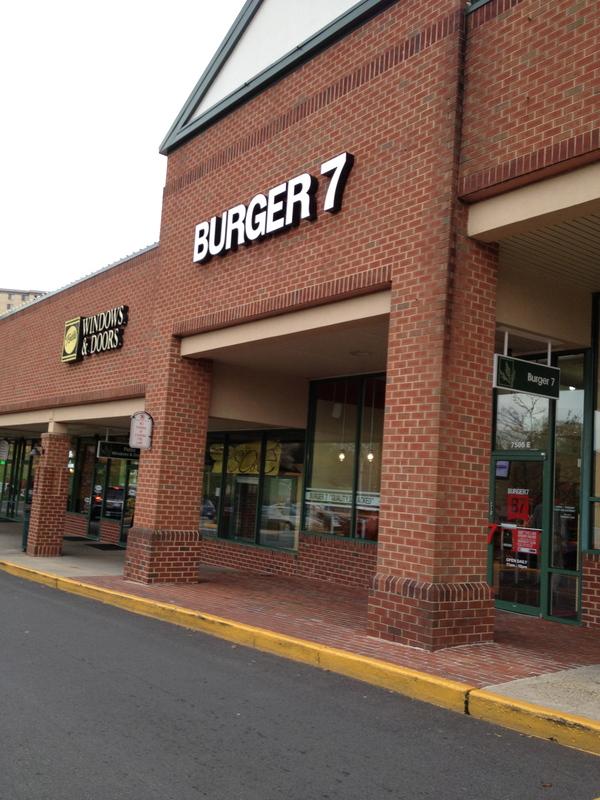 While traveling in DC in April, we discovered another simple and fast burger joint, just off the highway, Burger 7. Burger 7 offers a healthy alternative to those who crave a burger but are trying to eat healthy at the same time. The menu includes grass fed hot dogs and hormone free beef, turkey burgers and veggie burgers, whole wheat buns and lettuce leaf wraps, potato fries and sweet potato fries both cooked in olive oil, plus shakes made with organic milk. Burger 7 has three locations in the DC area, but we ate at the one in Tyson’s Corner. Where else can you get a burger? Do some sleuthing on the internet if you’re visiting a particular place or check out these links for favorite burger joints in Los Angeles, Boston, the Midwest, in South Carolina, and across the U.S.
Who serves your favorite burger? Trip taken 2012 and 2013. 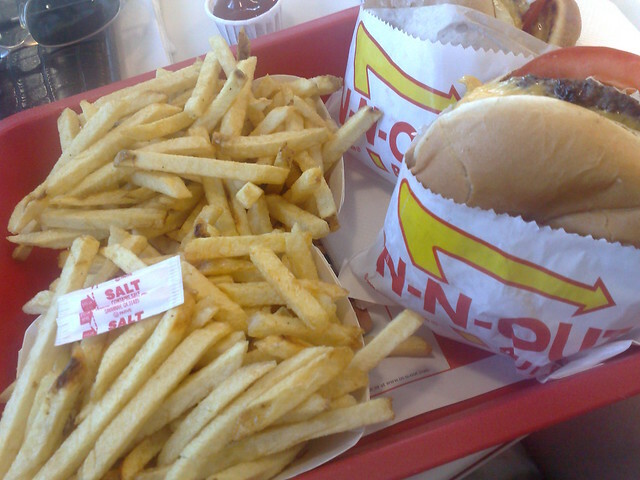 In-N-Out photo used under Creative Commons from whatleydude. Five Guys Burgers and Fries photo used under Creative Commons from kennejima. There aren’t many restaurants where everything is gluten free … and everything tastes good. Twist Bakery & Café in Millis, Mass., does not advertise its gluten-free qualities, but word of mouth has spread the good news. Not only can those on a gluten-free diet choose their food without thinking too much about it, they can bring their friends, too. All food is gluten free and peanut free and most items are soy free, dairy free, and nut free as well. On a recent visit for lunch, the gluten-free and non gluten-free diners in our group were excited to choose from the extensive menu. If we could change one thing, it would be their location. 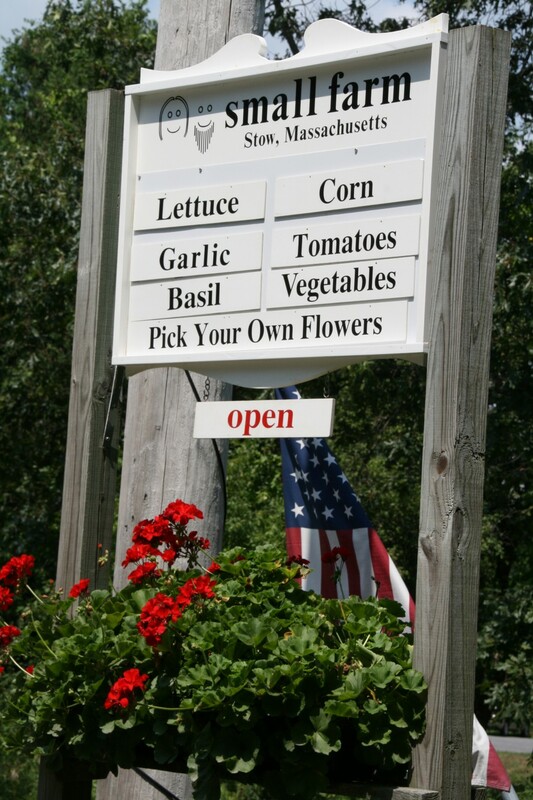 While Millis is only 25 minutes from Needham and 45 minutes from Boston, it’s an hour’s drive for us. If only they were closer, we’d be there almost every day.